Another absolutely gorgeous day, bright, sunny, and finally warm. It’s Larry’s turn to pick our route for the day and surprise, surprise…he decides we should take Milpitas Wash Road in the daytime and see what we couldn’t see on that other, not-to-be-forgotten nighttime excursion two years ago. Just outside the campground we cross the Bradshaw Trail and even have to wait for a truck to pass. 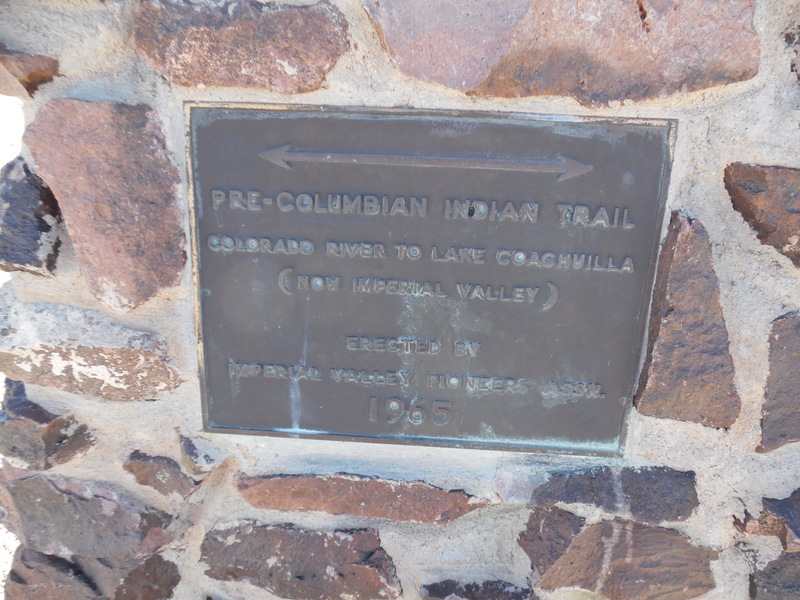 This was the first trail across the desert. Some of what I’ve read lately says it may have been closer to where I-10 is now, but today’s version runs from Blythe on the east end almost to the Salton Sea on the west…way more miles than we want to travel on rocky, sandy roads. We’ve been half way to the Salton Sea on it and saw “Noah’s Ark” two years ago and don’t need to do that again. We pass the turnoff for the Houser Geode Beds, just a few miles south of here, then the wash Larry had to cross to climb up a hill to prove to me the “rock outcropping” that went around the end of the hill wasn’t natural. It isn’t. It is a line of rock fortifications put up by Patton’s troops. Our Wiley’s Well Road becomes Milpitas Wash Road and is rocky, somewhat rutted, and mostly sandy through this low pass through the hills but the view when we finally get to the top of the last ridge is worth it. We suspected there was a good view somewhere but that dark and scary night, we were intent on getting home in one piece. We stop many times and scan the hills on both sides with binoculars. Some of the scars on the hills are probably attributable to Patton’s troops. Ecology and conservation weren’t burning issues in the 40’s. Others appear to be game trails…there are bighorn sheep in the area…and still others are mining roads. Yet others are probably tracks left by off-roaders who consider the “stay on established roads” edict to apply only to others. Whatever…they give us lots to check out and make guesses about. Coming down off the ridge, we can see clear to the Mexican border. Closer at hand, we can see scattered RV’ers/squatters/desert rats set up in the open lands next to the bombing range. The name of the road becomes obvious as we ease our way through sandy braids of a large wash. Somewhere three or four miles short of the highway we’re aiming for, I suddenly go “whoa…back up a smidge…lookathat!” WAY off in the distance, a pale blue peak arises, far behind any of the closer ranges. A peak so distinctive it must have been a landmark for anyone who ever lived in this part of the desert. It is the same Castle Dome in Arizona where we explored the ghost town at its foot! By the time we reach the highway, we have dropped just enough more in elevation that we can’t see it any more. Soon after we reach the highway, it splits into two routes and we take the one to the west. A few short miles later we find the monument we are looking for. 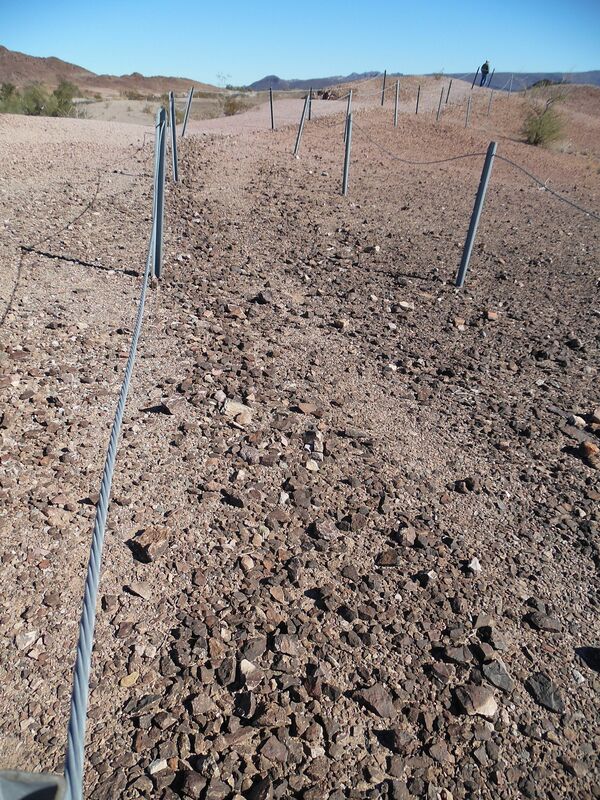 Fenced off for preservation is an ancient trail across the desert. The finest description I have found of these trails is in the book The Secret Knowledge of Water by Craig Childs: “The trails were formed by the passing of countless feet, which sorted each small stone to its flattest profile. These prehistoric routes are not consciously constructed. They are instead recordings left out of habit, out of slow repetition, obviously of some antiquity because many pass through three-hundred-year-old saguaros without flinching.” This particular trail does not pass through saguaros because it is in California, but the description fits otherwise. We follow our highway past the GFOC mine, a huge open-pit gold mine which is apparently making some $100 million per year. It is also known as the Mesquite Mine and apparently has been there a long time, just reactivated in 2008. When I have better wifi I will research that further. For some reason, the Salton Sea has never really interested me. Its present incarnation is more accidental than natural and has existed for only 100 years or so. But many times over the last several thousand years, there have been inland seas here. It stretches for many miles, is very salty and terribly polluted. Much has been written about its origin and the resorts that could have/would have been here. And some actually were here. I think a lot has changed since I was in college and visited it a couple of times back then, but again, that’s something for another day of research. Some of my Facebook friends from college who have remained in Southern California may have more to add in comments…go for it! 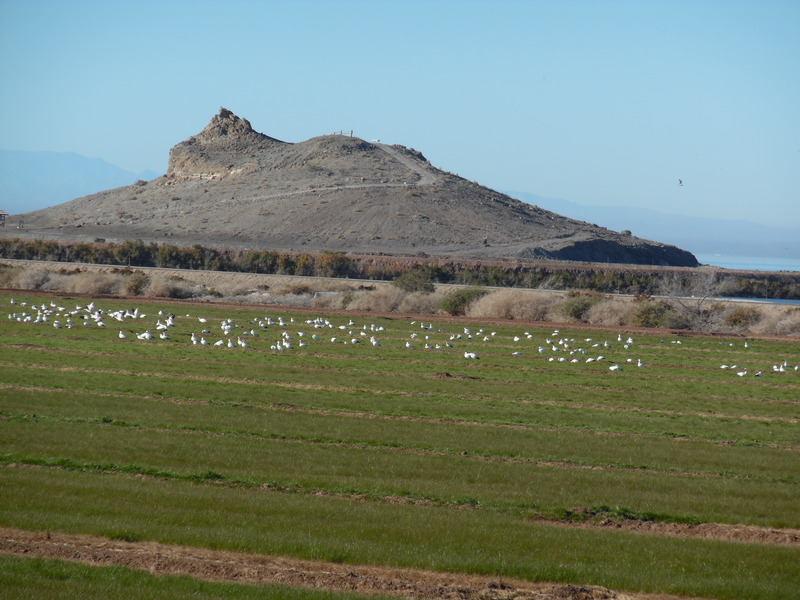 We drive north along the eastern shore to the town of Mecca, where we took a most beautiful short-cut through Box Canyon and out to I-10 for the almost hour-long trip back to our Wiley Well turnoff.